3 Bedroom Terraced House For Sale in London for Guide Price £1,750,000. 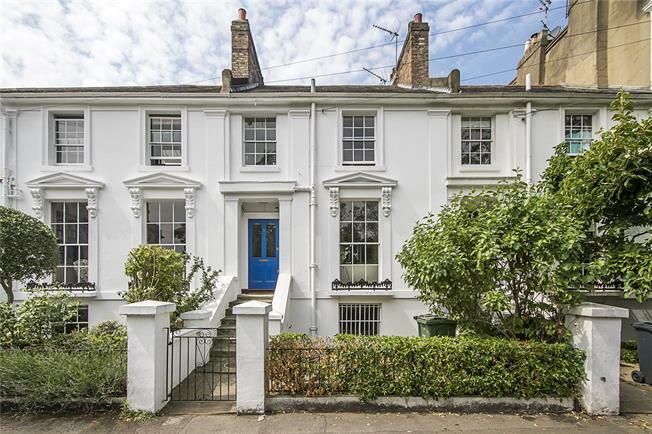 An elegant and rarely available three bedroom, Grade II listed stucco fronted house situated on this most sought after garden square in the heart of Clapham Old Town with a stunning, mature south-west facing garden. The well balanced accommodation is laid out over four floors and comprises briefly; entrance hall, well proportioned double aspect reception room with ornate open fireplace and floor to ceiling sash windows allowing ample natural light, cloak/shower room and a utility area with access out to the garden. On the natural lower ground floor there is a kitchen to the back and an office/reception room to the front with a door to a useful store room. On the first floor, there are two double bedrooms and separate family bathroom and an additional generous bedroom in the loft. Grafton Square is a lovely early Victorian Square in the heart of the Old Town part of Clapham with its gracious Regency style early Victorian houses. The amenities of Clapham Old Town and the wide open spaces of Clapham Common are situated nearby, with Clapham Old Town itself offering various restaurants including the Michelin star rated Trinity, numerous bars, boutiques, cinema, supermarket and gym. Local transport links including Clapham Common Underground Station (Northern Line) and Wandsworth Road Overground Station (part of the newly-opened London Overground orbital train network), that along with excellent local bus services provides quick and easy access into Clapham Junction, the City, the West End and Canary Wharf. There is an excellent selection of local state and private schools including nearby Eaton House, Parkgate School, Broomwood Hall, Thomas’s and L'école de Wix Lycée français. Outside, there is a stunning and mature 57ft south-west facing garden being mainly flagstone paved, interspersed by specimen trees including an impressive Mulberry and numerous flower and shrubs borders.